Zoulah is back bringing very simple cupcakes to make for Halloween! 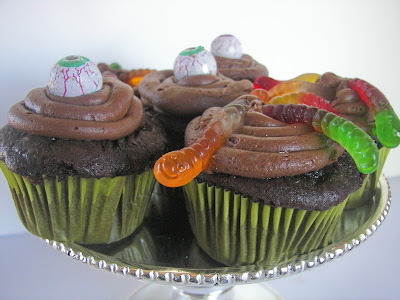 She saved some cupcakes from the Moldy Mummy cupcakes, and whipped up some frosting and just added worms for "Worms in the Dirt" and eyes for "Ogre Eyes." These are fast and simple to take to a Halloween party this season. Zoulah wants you to take a look at that cute little orangie worm! He/she has a little smiley face and eyes! She wants to tell you that as she scarfed politely ate gummy worms before she never noticed they had little faces. She apologizes to the other worms for burying their faces in dirt. Maybe the greenie guy to the far right has his face out of the dirt -- Zoulah is not sure. Zoulah thanks you for dropping by Red Couch Recipes where Zoulah always has more tricks and treats in her apron! O.K., those eyeballs are grossing me out! LOL I'm sure these will be a bit hit at any Halloween party. So cute! I want to make these for work for our party! That gummy worm is so cute! I don't think any of my kids ever stopped to look for faces. The cupcakes are great for Halloween. Something simple but very cute...wouldn't kids of any age love these! So cute...I have to tell you I have LOVED your blog and ideas this month!!! Ooh, these look fun! My boys would LOVE them! 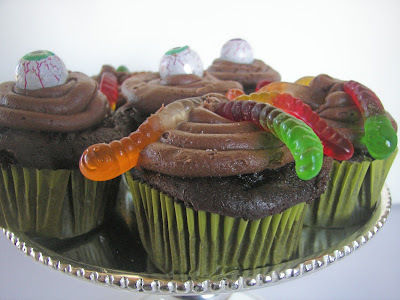 yet another fabulous halloween post...these cupcakes look good enough to eat. love the eyeballs..so creepy. thank you for linking up to tuesday night supper club. 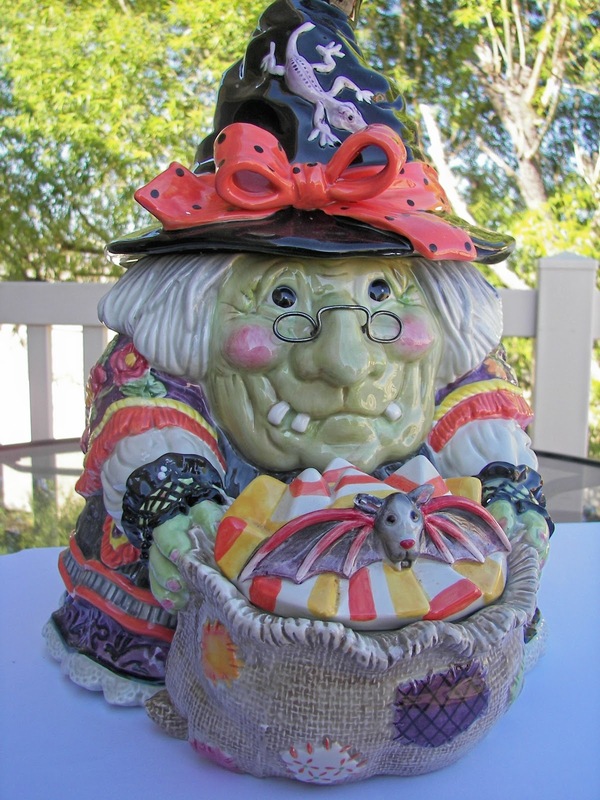 i am loving your halloween goodies...keep them coming because i am getting inspired by you! Everytime I visit, I get into the Halloween spirit, more and more! Thanks for sharing these fun cupcakes on Cupcake Tuesday! I hope you can join us for the Holiday Cupcake Challenge in November! Oh e is for excellent- I have been looking at lots of icing ideas, but shall look no more! I think worms like to have their faces in the dirt. so no worries! They eat the stuff that is in the dirt, so those worms should be very happy! Great icing job! The gummy worms are so cute. What about the eyeballs? Are they homemade? 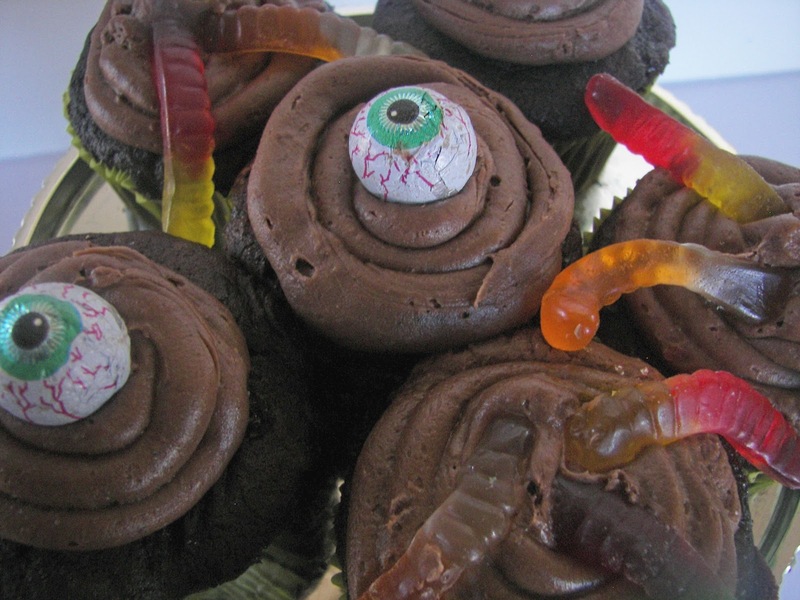 Ooooooh, these are very ghoulish cupcakes. I wouldn't mind saying boo to have one one. My boys would to eat eyeballs and worms! Yum! Eyeball cupcakes are my favorite. These are too cute! I made some similar for my daughter's birthday last weekend: green frosting "grass" and candy pumpkins on top. This is a creative take on the "cup of dirt" dessert! Oh no! They have faces? Yikes! That made me laugh. I never knew either and I wonder if the Grands did. We're doing a little pumpkin carving thing with them on Saturday morning...I'm using several of your ideas for it to make it extra fun! Thanks for linking this creative and delicious post to Alphabe-Thursday.